There are legends and folklore that surround most things we are passionate about. But with the passing of time you can often miss the original point of what you initially found so interesting and so captivating – points lost in recreation and poor interpretation. For that reason I often wish I had a time machine. No, I’m not some sort of unrealistic day dreamer and in no way do I want to turn back time, but once in a while I really think that it would be fascinating to head back and immerse yourself in a bygone culture; to eat the best steak in the world instead of cooking it from a set of instructions. 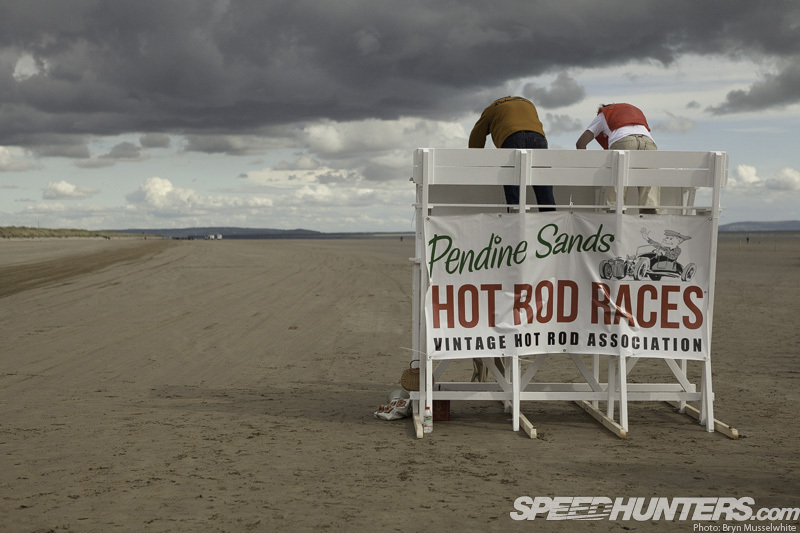 That’s why I’m here at Pendine Sands in South Wales, because there’s a chance that the best automotive meat I’ve ever tasted is going to be served up here pretty soon. First up you need some history to understand what I’m talking about though. 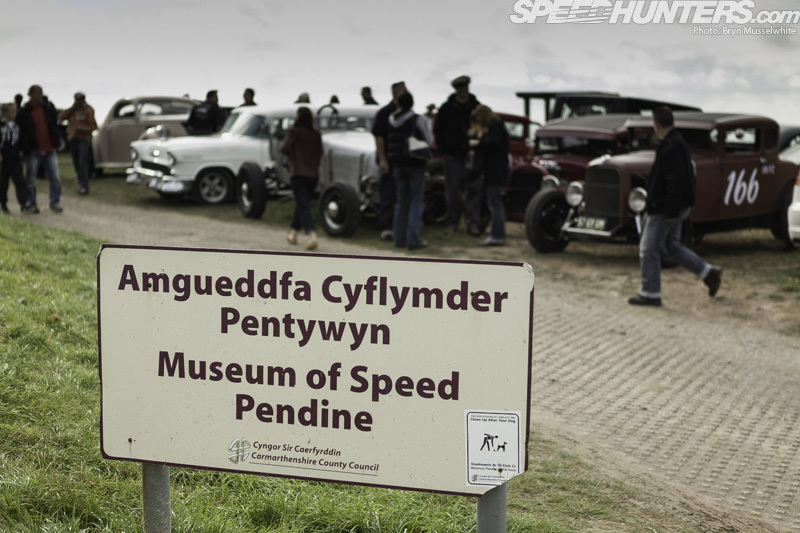 There’s a museum for the many achievements witnessed here and some day I’ll come back and show you more of this #templeofspeed. Right now you’ll have to trust me though. 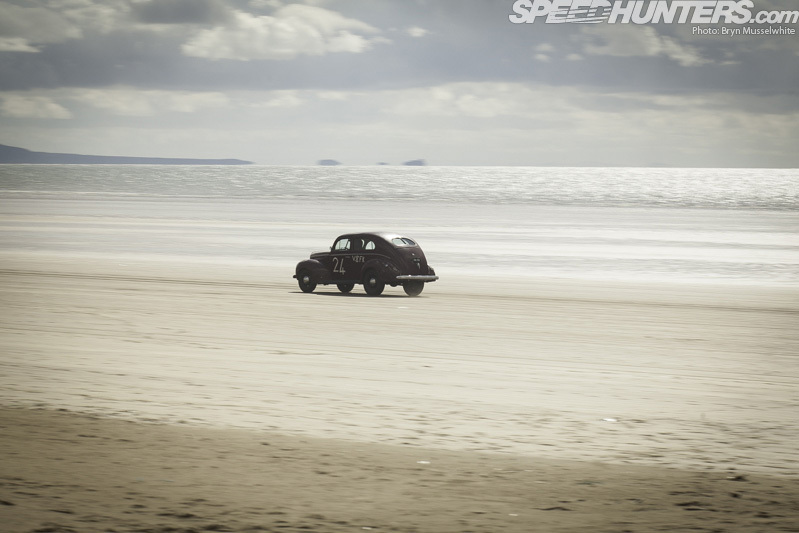 In the British Isles we have very few places to try and go as fast we can. 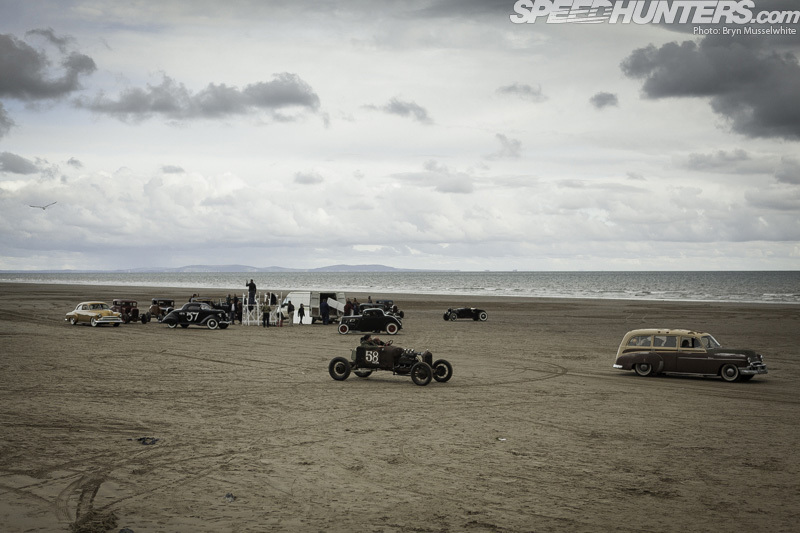 In fact, we’re limited to two second world war airfields and the sand here at Pendine. 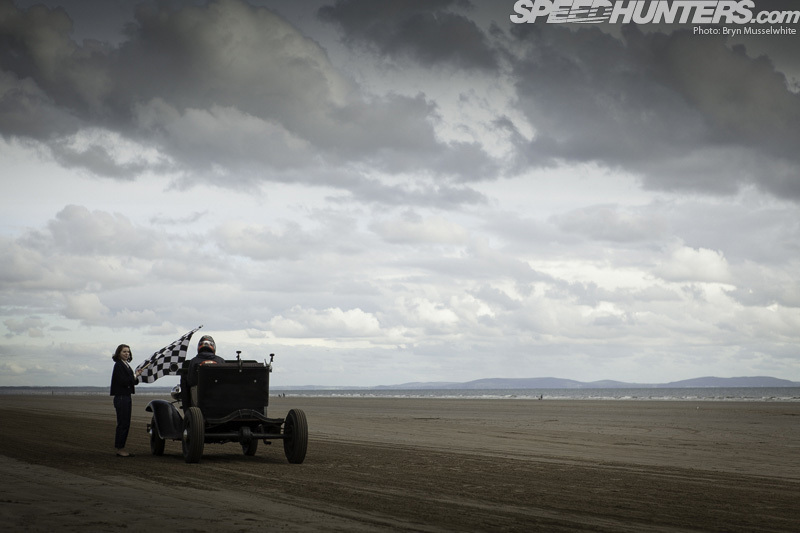 So in the early 1900s anything fast and pre-war was tested here when the roads became less able to contain the speeds and the smooth, seven-mile long expanse of sand made higher mph possible. 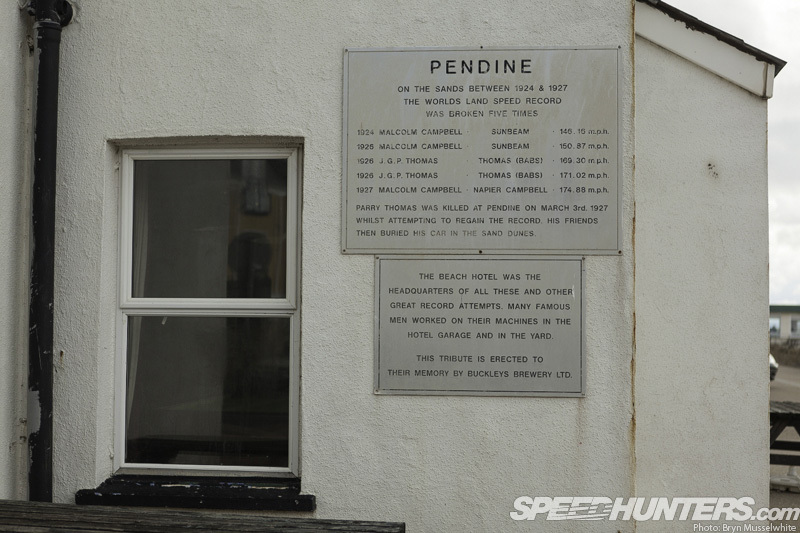 Two tales stand out for me: the first is of Malcolm Campbell who was the first person to use Pendine for a world land speed record attempt. 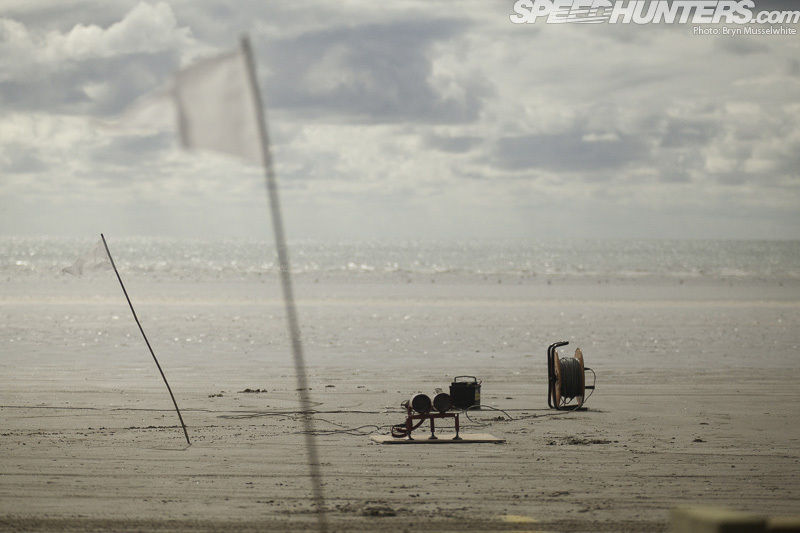 He successfully achieved a speed of 146.16mph here almost exactly 90 years ago on September 25th, 1924. 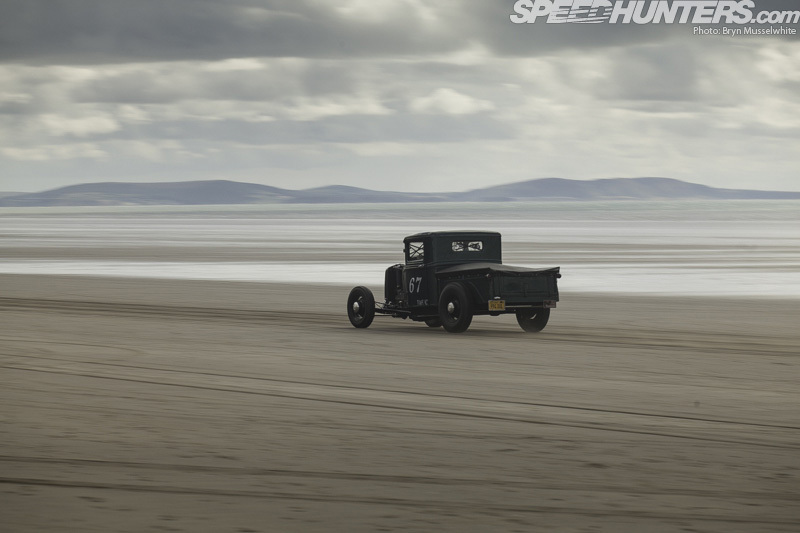 A battle ensued over the next few years and Welshman J.G Parry-Thomas lost his life here in March 1927 when his car Babs rolled at roughly 170mph, killing him instantly. 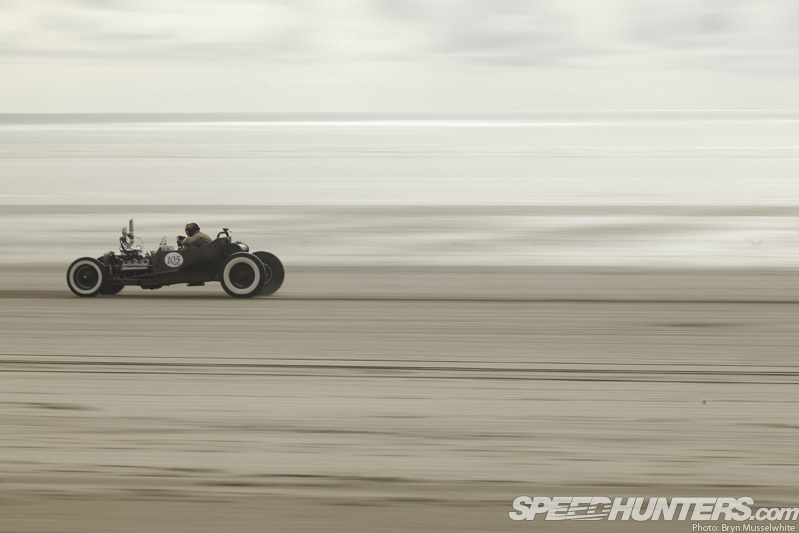 His friends buried the mangled wreckage in the dunes and there it remained until it was dug up in 1969 and restored. Today she sits in a large glass window in the front of the museum. 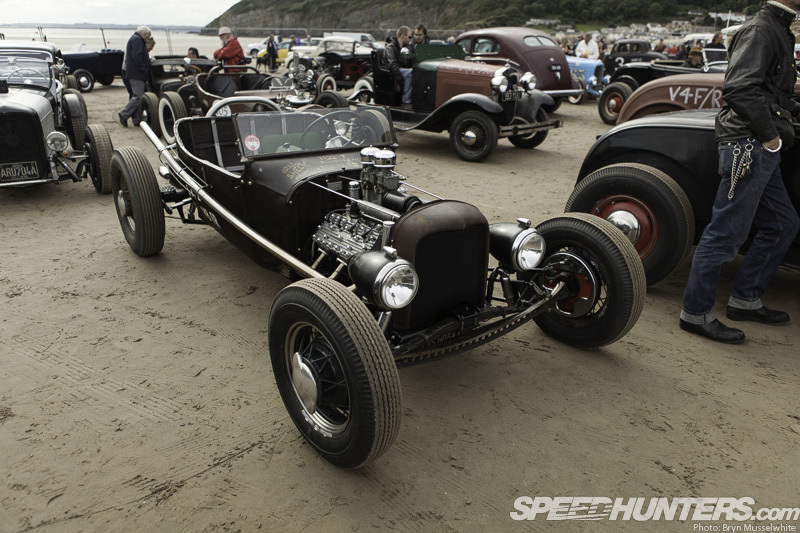 That’s the building on the left, looking out over the assembled throng of hot rods assembled here to chase the dream across the sand. The real magic dawns on me very quickly as I see the tide ebbing slowly back towards the horizon. 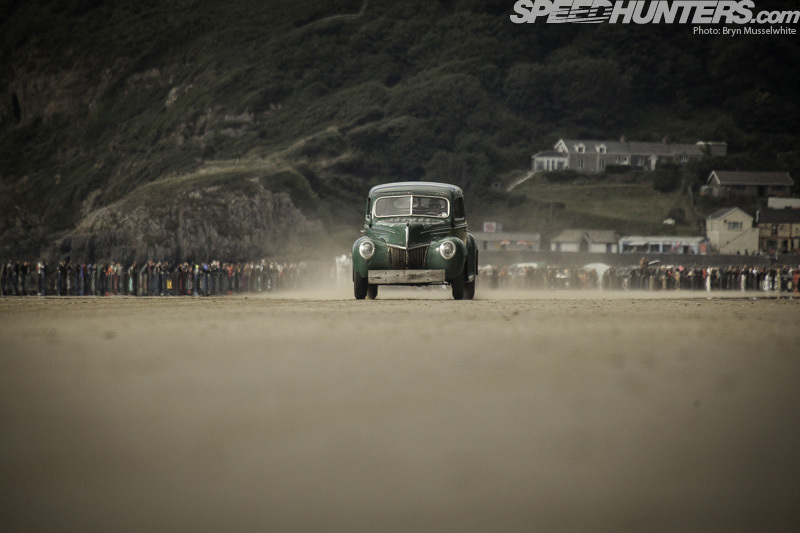 This isn’t like Brooklands or a decayed and forgotten Spanish race track. Everyday there is a fresh track, a fresh line. This scene can never get old, because every day it’s new. It sends a small shake up my spine as I feel the anticipation in the air – this is special stuff. But we have to be patient and wait for the water to do its own thing, just like it has for millions of years prior to this day. Up here on the high ground are the weapons of today’s land speed warriors. 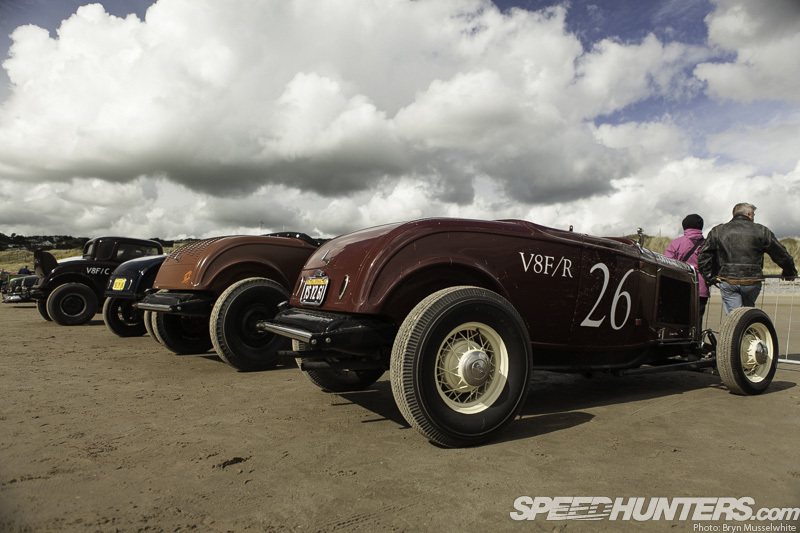 Numbers have been limited to just 100 cars, which is actually quite a lot, all things considered. 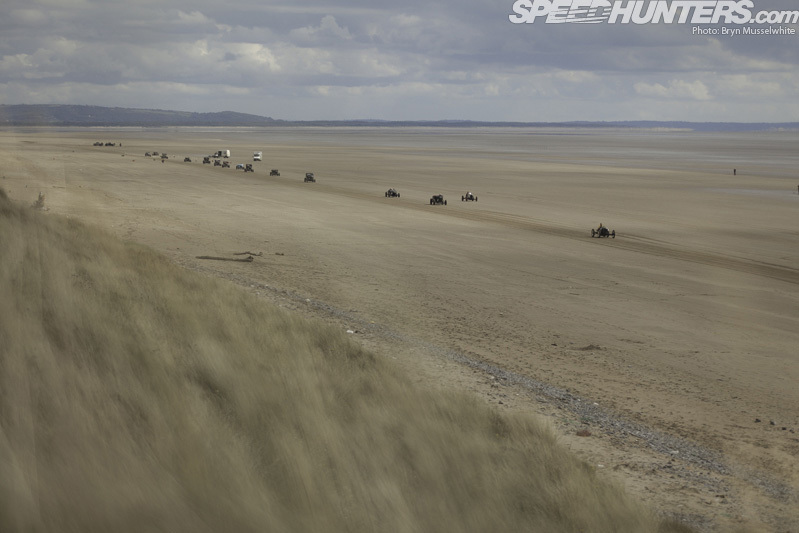 This is an event that’s never run before, that couldn’t be set up the day before, and pretty much everyone here has never driven at high speed on sand. Anything could happen. 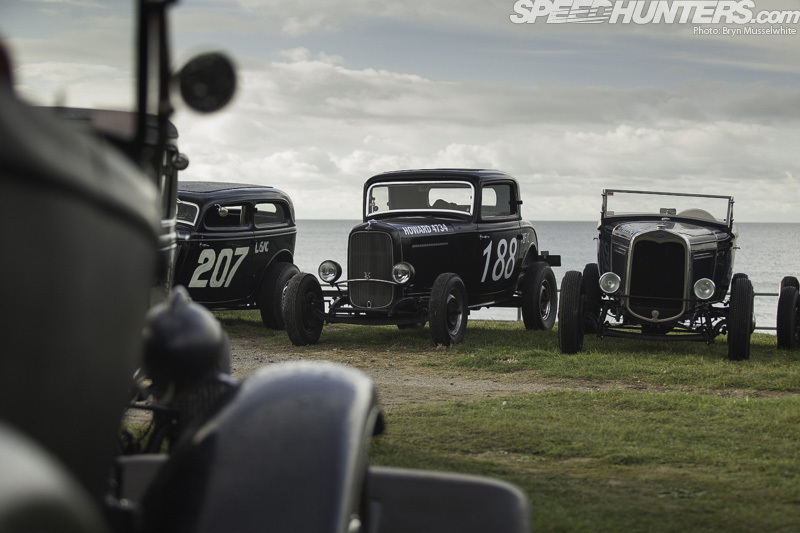 Everybody is part of the Vintage Hot Rod Association, so they’re use to dealing with old hot rods. 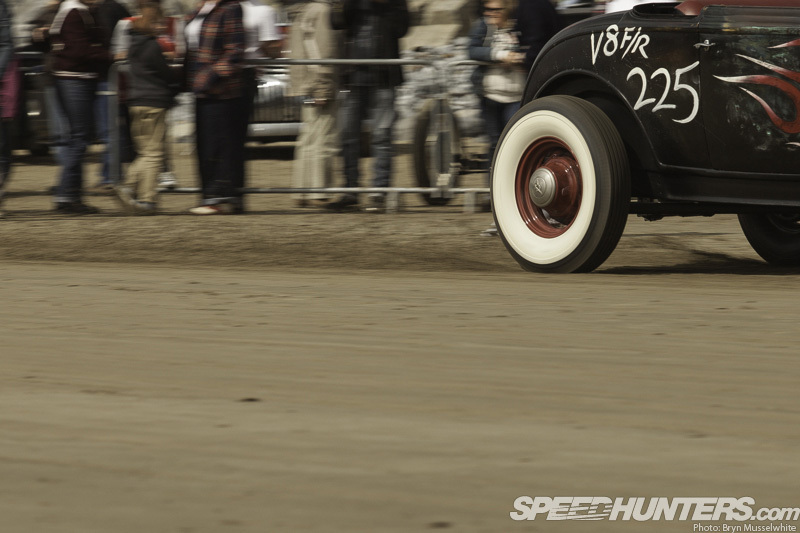 In order to compete, vehicles needed to be of pre-1949 construction and be using original or vintage-type suspension and engine components. Keeping it period in other words, and doing it as it would have been done back in the day in America. With the water retreating, the clock is now ticking. It’s around 10am when we start to make our way down onto the beach. The entire course needs walking and any debris that’s been left by the outward tide needs to be removed, so it’s all hands on deck to to give it a clean sweep. The head of the pack in the distance is pretty much where the pit area will be. And soon enough that area is filling up nicely. Although you can see in the background here that the sand was still a little soft; the big Chevy pickup getting bogged down in the borrowed ground. But what borrowed ground it is. I like the fact nature doesn’t let us play here whenever we want. Like the planning of this event, time has had to be taken and all the elements come together for one very special day to happen. Marco Warren in car #3 took the honours of getting the ball rolling, and this is the first run of the day. Organiser Neil Fretwell took #2, but #1 wasn’t assigned. There were classes for 4/6/8 and unlimited cylinders in case any 12s turned up, with seperate designations of ‘B’ for blown (either supercharger or turbo), ‘F’ for flathead. Body classes were as follows: ‘R’ for roadster, ‘C’ for closed cars, ‘M’ for modified and ‘K’ for full body. When I woke up around 6am there was rain pouring down on the roof of my B&B; millions of tiny wet reminders that after a beautiful British summer we’re dancing with bigger powers here. 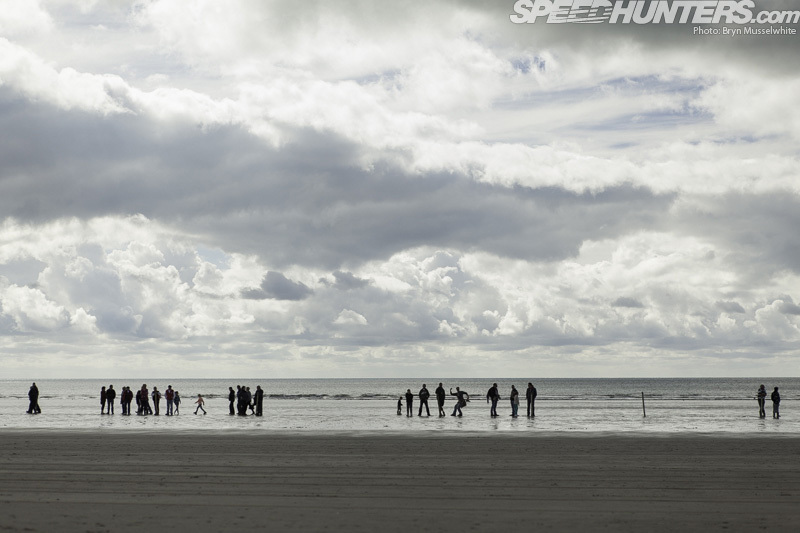 Racing has started though, so I don’t hang around the pits for any more than five minutes. 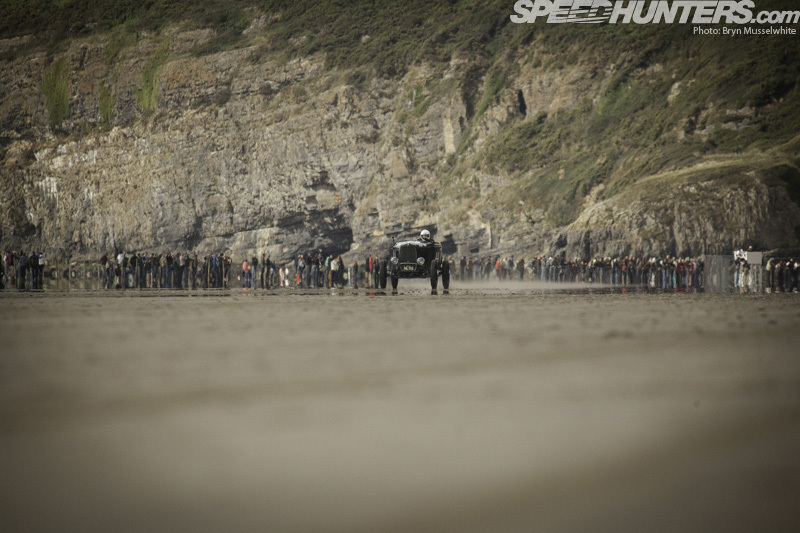 I want to see the action out there on the sand. 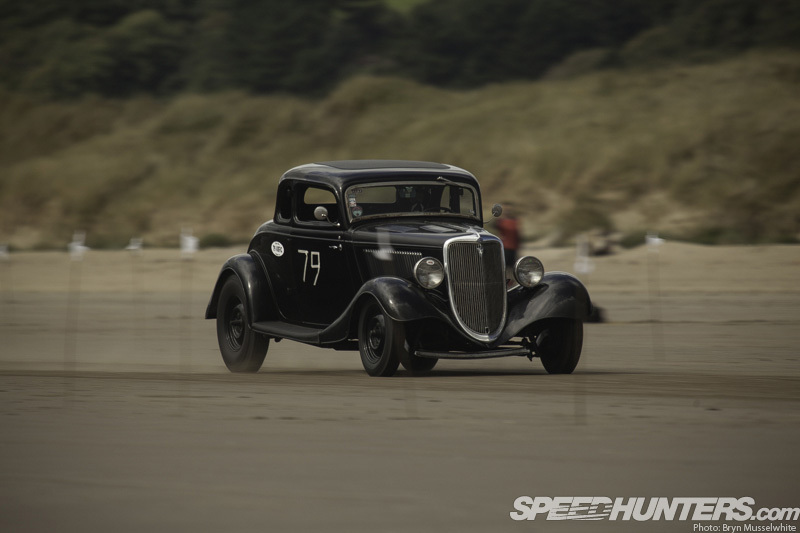 This is Paul Beamish’s gorgeous ’34 Coupe driving off the line, running a blown flathead V8. 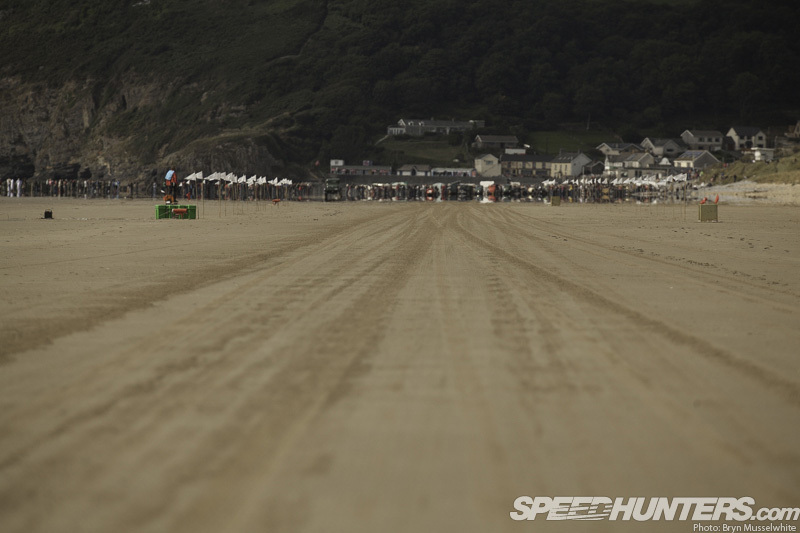 This is not a drag race though, and even though some people break traction away from the start there’s a mile or so to build up to speed before you enter a timed section.The sand is solid, but ultimately it’s just sand. I know the salt at Bonneville is a crust, but it’s still much firmer than this surface which was under water a couple of hours ago. Walking up the dune line, I turn to take in every run. I don’t want to miss anything. 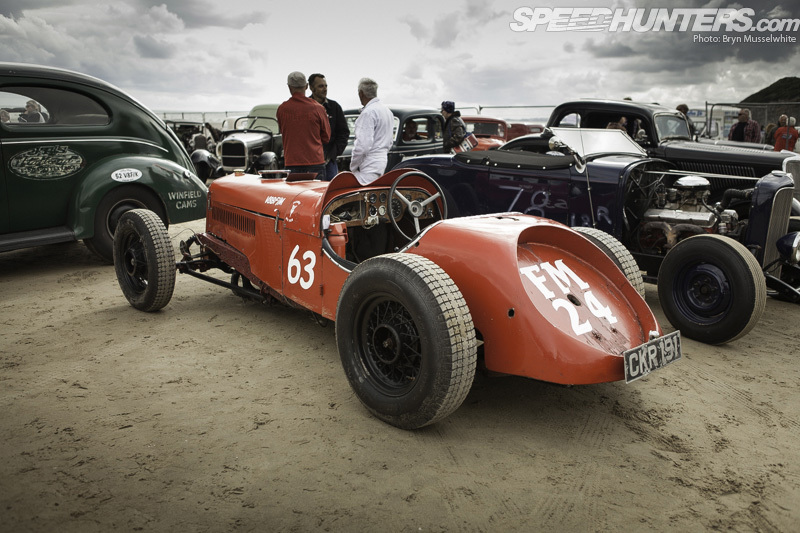 As the stripped-down, hopped-up rods appear from the mass of people on the start line – building speed and bearing down on that timed area – you start to lose a sense of perspective. They’re almost frozen in time, growing in stature instead of coming at me. … tripping the beam at one end to start their timed run. After talking to a couple of drivers later in the day I realised just how hard it was to pin the location before there was a clear path of tyre tracks. 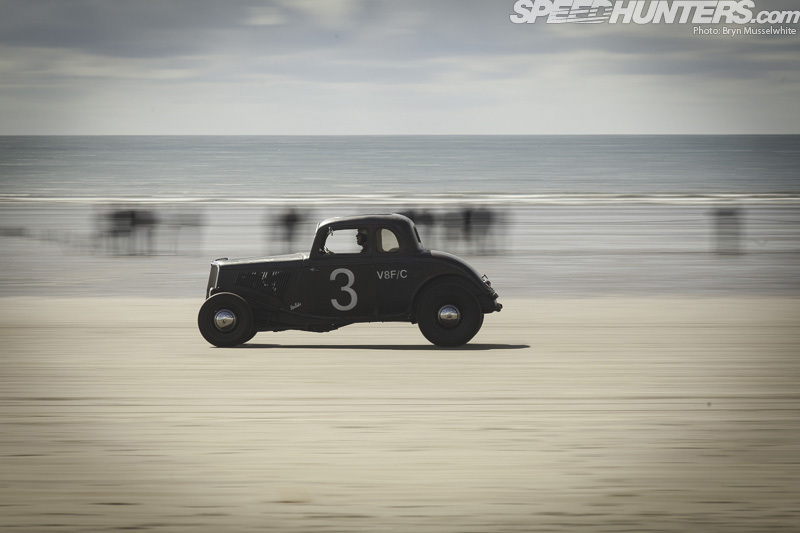 The speeds were impressive, but maybe more so was the courage of the drivers. I thank my lucky stars that large governing bodies hadn’t smudged the event with monstrous safety stipulations and ugly additional, modern day equipment. It might sound naive, and yes I know accidents can happen, but you know what? Everybody here is a consenting adult who knows what they’re getting into and nobody is pushing them. 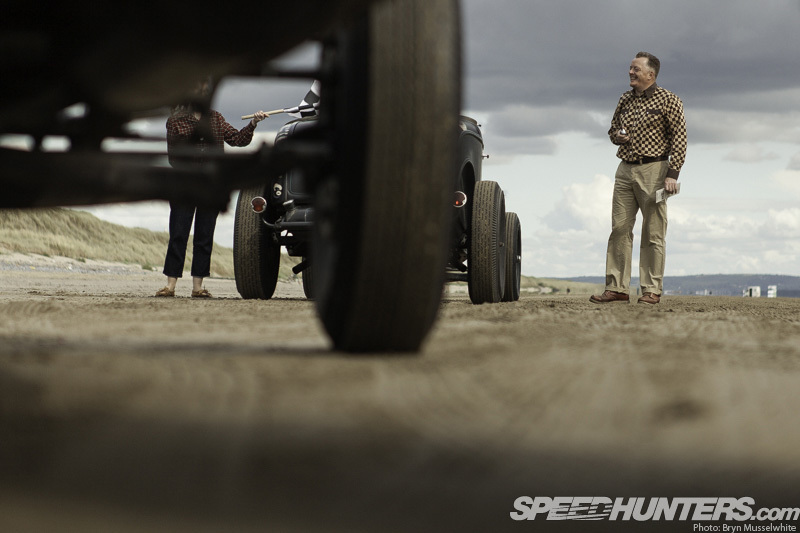 This is about men and women driving as fast as they dared, however they wanted to do it. 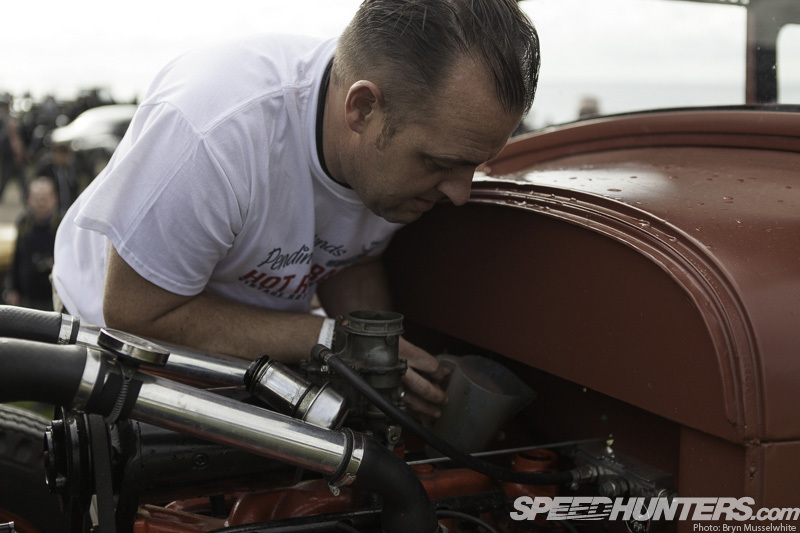 I’ll show you more of this T in another post, but its induction set-up had me smiling all the way back in the pits. 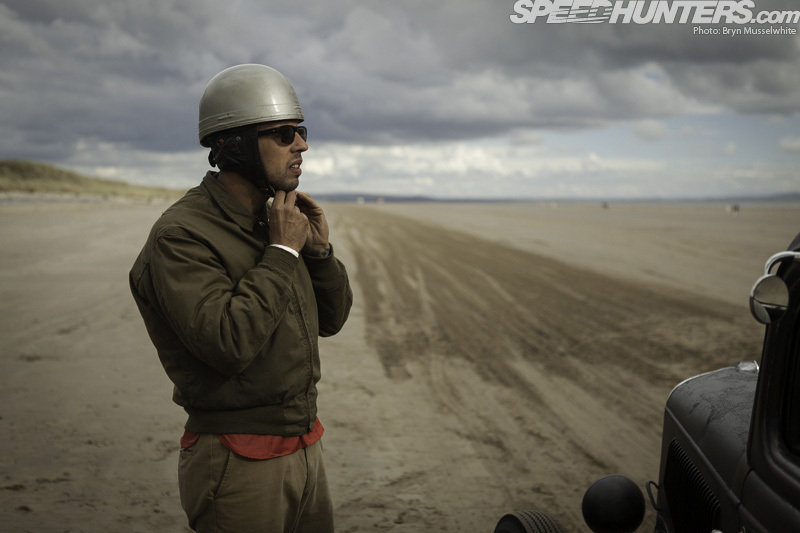 Driver Kevin Helsdown is seen here hunkering down for added aero/hero points. 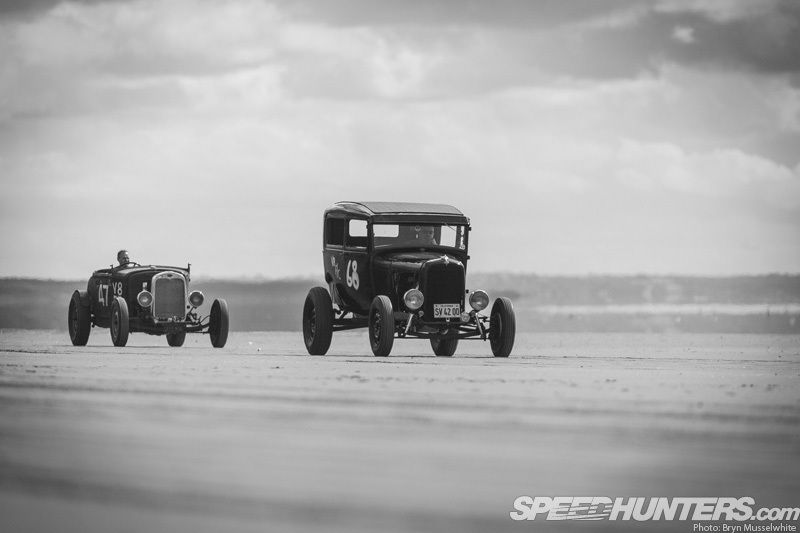 The drivers then had another mile or so to slow down; the surface not really lending itself to a hard application of brakes. Mike Pickup in his Ford Sedan winds down after one of roughly three or four runs each driver had during the day. As I sit watching them I’m getting very envious. 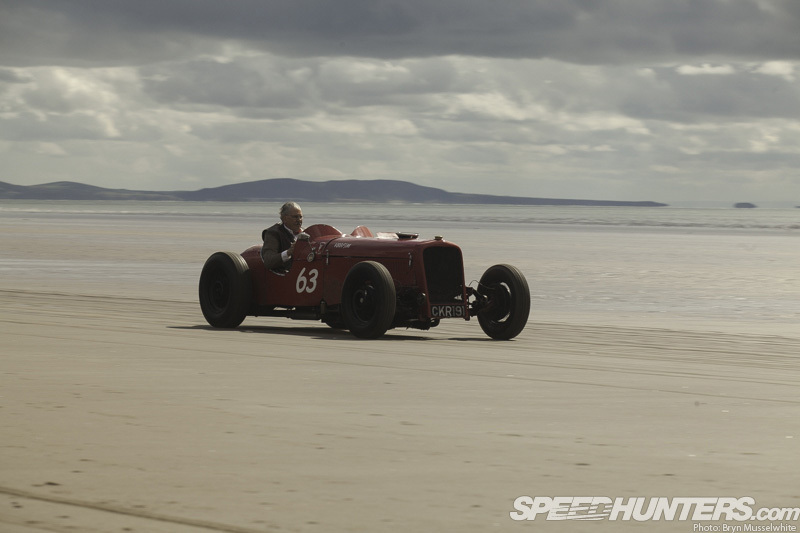 The drivers all say that the surface is skittish though; skinny crossply tyres not really cutting into it and as the wind dries the sand out even more they tell me that as the speed builds you feel like you have less and less control. Many are fearful that any sort of sudden movement will prompt a wheel to dig in and flip the car. The collection area at the top end must have been awash with drivers swapping notes on the surface and how to handle it. 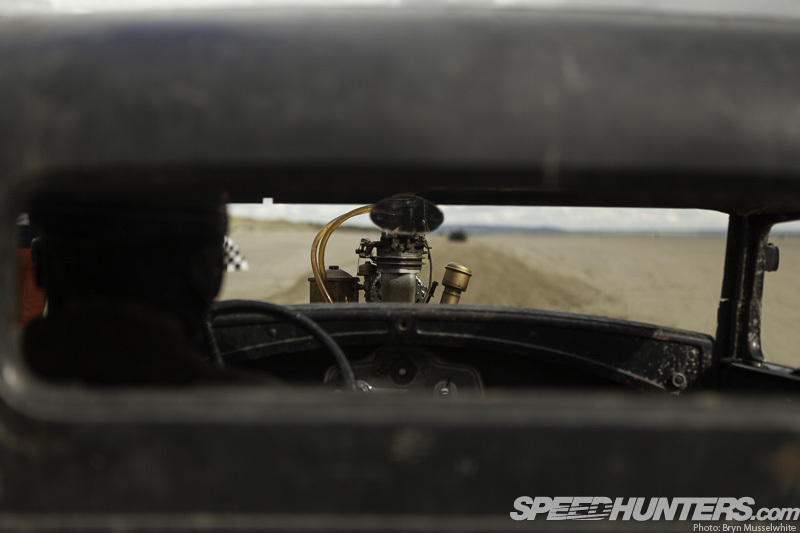 Sure, there’s been a little research here and there and I speak to a few drivers who’ve had words with American friends who have run at places like El Mirage. 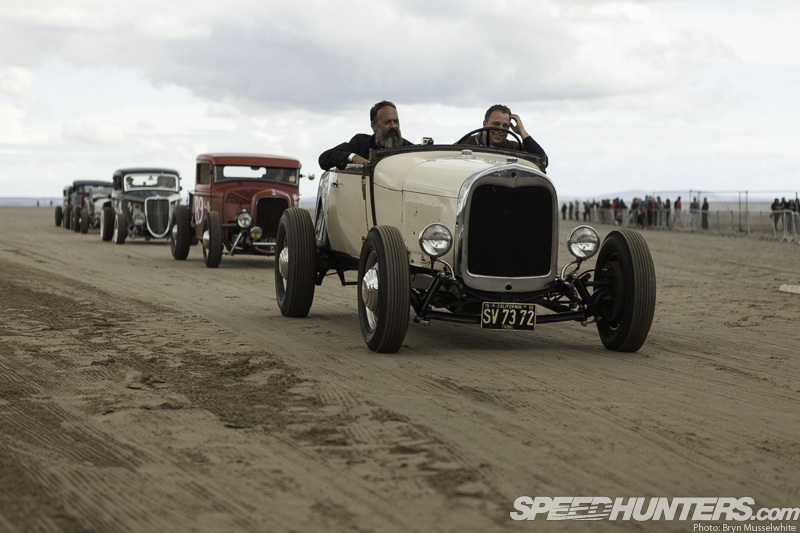 After all, this event is also harking back to the halycon days of southern California’s dry lakebed time trials. But largely they’re just out there seeing how it feels and making it up as they go along. For me, this only adds another element of authenticity. With trials halted for a few minutes, the first batch of drivers head back down to the pits and I get to sit and watch as they rumble by. Like I said, this event isn’t trying to recreate anything because it’s never been done before. 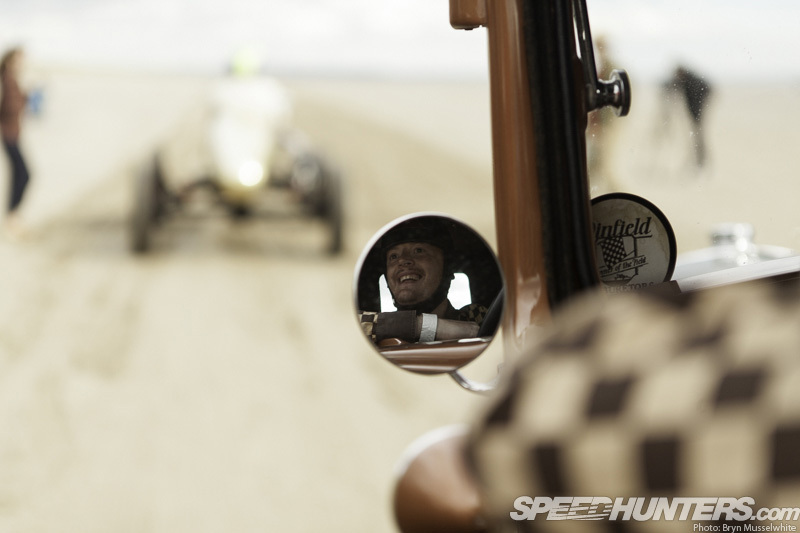 It’s very much in the spirit of bygone land speed racing though. For this and the last picture – no digital watches, modern helmets, bolt on DSLR cameras or anything else to foul the scene. 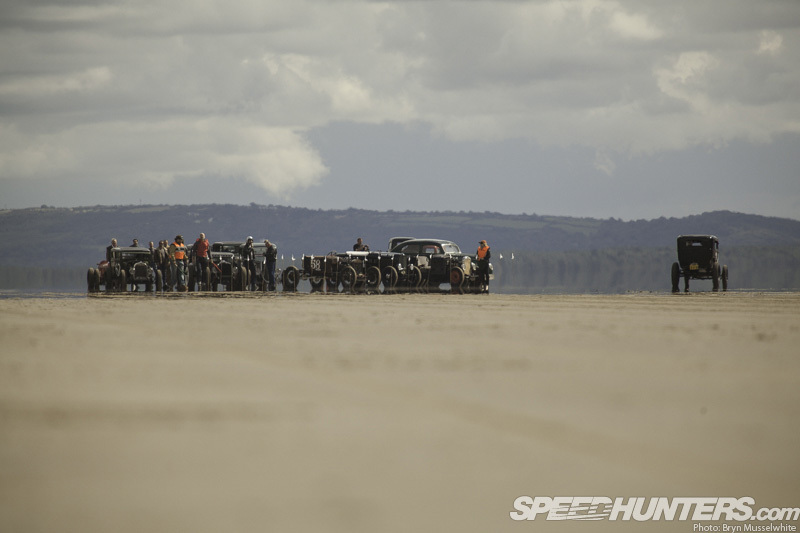 As I head back to the pits, I look across and catch some of my friends digging the scene on my 400mm lens. Although the limited number of pit passes sold out months ago, public access was free and plenty took advantage of it. Looking back up the line, where you can see the two larger white vehicles on the far side is where the timed area is. The slightly darker line being the racers’ only guide as to where the numbers get counted. 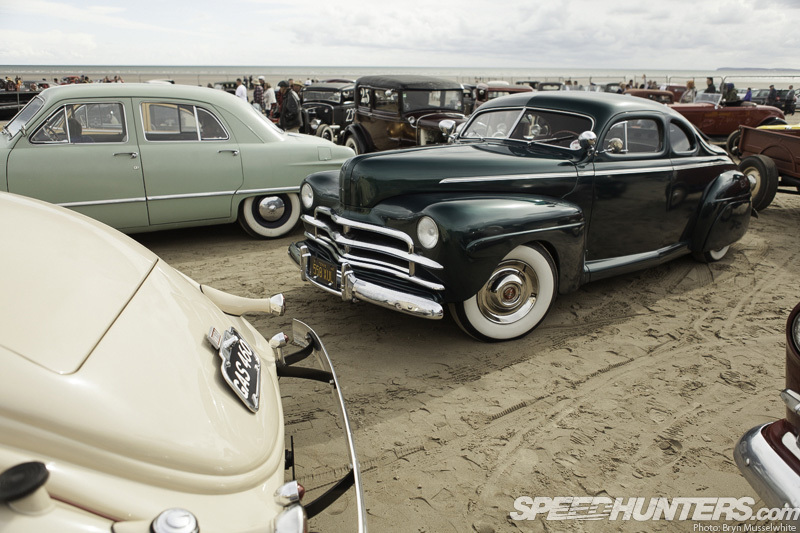 There was a cut off date for all vehicles in the pits too, but seeing as it was 1954 it meant there were some gorgeous kustoms around to mix it up with the rods. 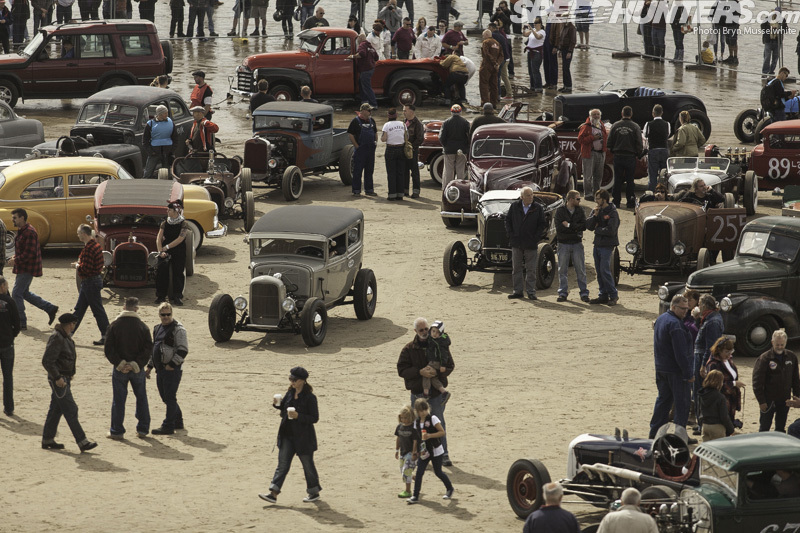 There was a wide spread of early Ford tin present, as you’d expect. 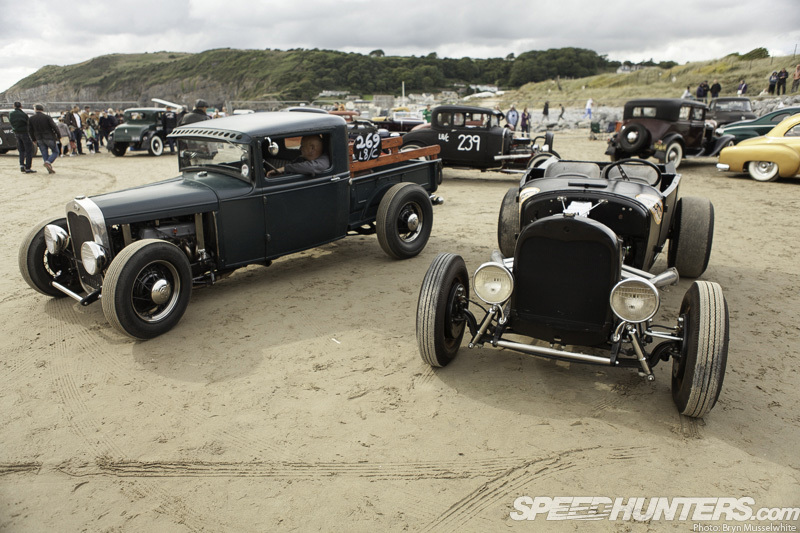 With this Model A pick up here on the left and T showing two different approaches to a similar body style. 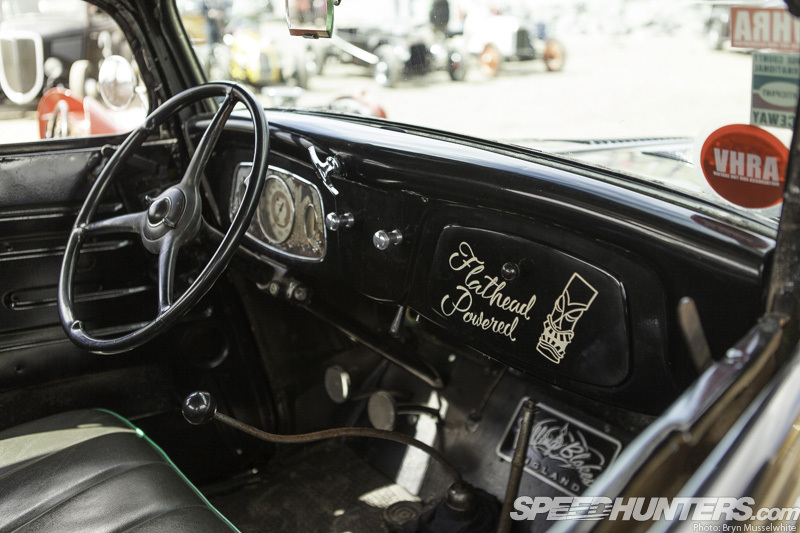 Interiors were largely sparse affairs, and the flathead V8 seemed to be the motor of choice. That’s to be expected given the large numbers it was produced in, tuning potential and the period perfection it adds too. 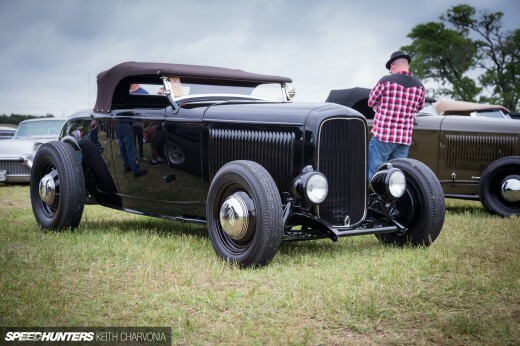 As was common in California back in the day, Fords naturally made up the largest percentage of entries. I’ve always preferred the Model B though. 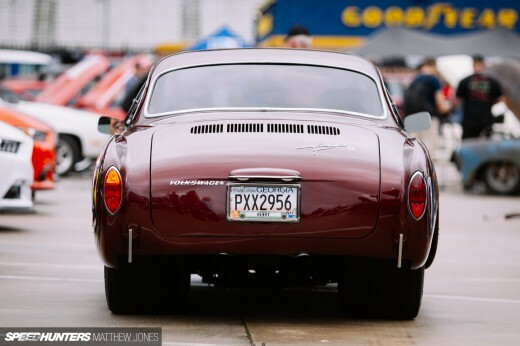 There’s just something extra about that kicked-up rear and smaller front end that gets me going. 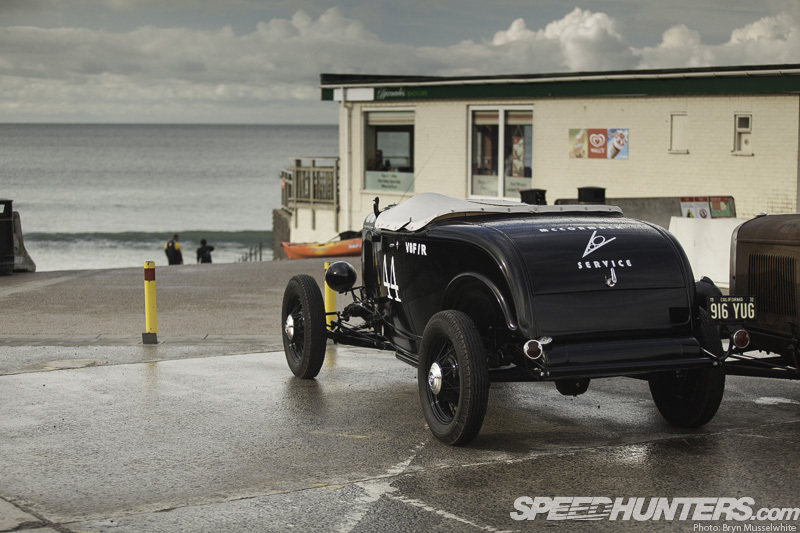 I was raised by a father who did illogical things so that he could buy, build and race pre-war cars. So it’s inevitable that at some stage I will own something from this era. 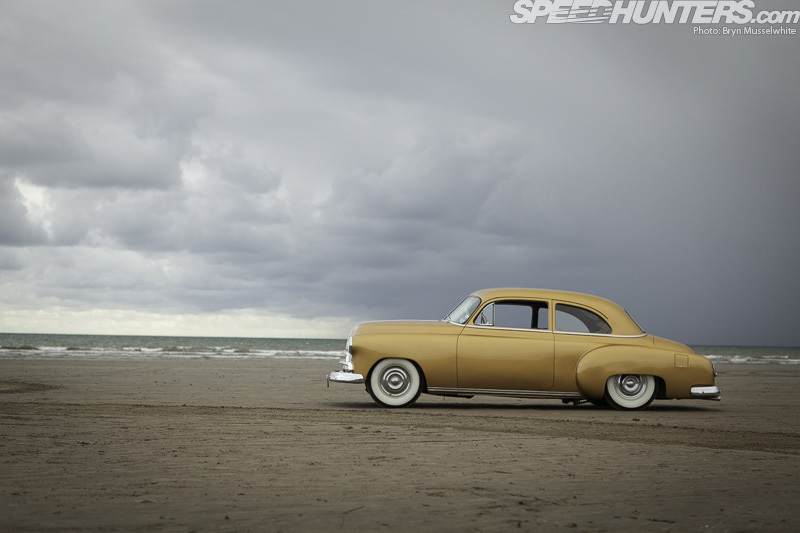 The closest I’ve come so far was a ’47 Ford Tudor, which from the bulkhead back is essentially a ’39 Ford. It was quite popular for moonshine running given it’s large boot/trunk space. So if it’s good enough for Junior Johnson who went on to become a NASCAR legend, it’s good enough for me. You might be wondering just how fast is fast then? 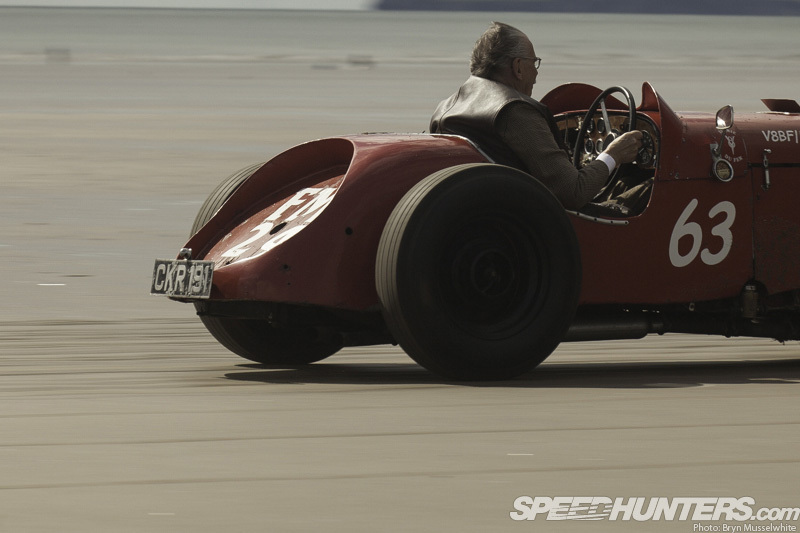 Around mid-afternoon I found out that this flathead-powered special was running around 115mph. Sure, that might not sound a lot to a generation who’ve grown up on turbocharged Japanese metal, but consider this – you’re looking at technology older than your parents and quite possibly older than your grandparents. Can you see the drilled chassis for weight saving? The sea will have all of this covered long before the evening’s entertainment gets into full swing, so we’d better get some more runs in. Back in the pits, Neil gathers everybody around and tells us it’s just about possible for one more run if everybody lines up and goes off and then returns in one full group. Nobody needs telling twice. Marco who started the proceedings gets his helmet on with quick pace. 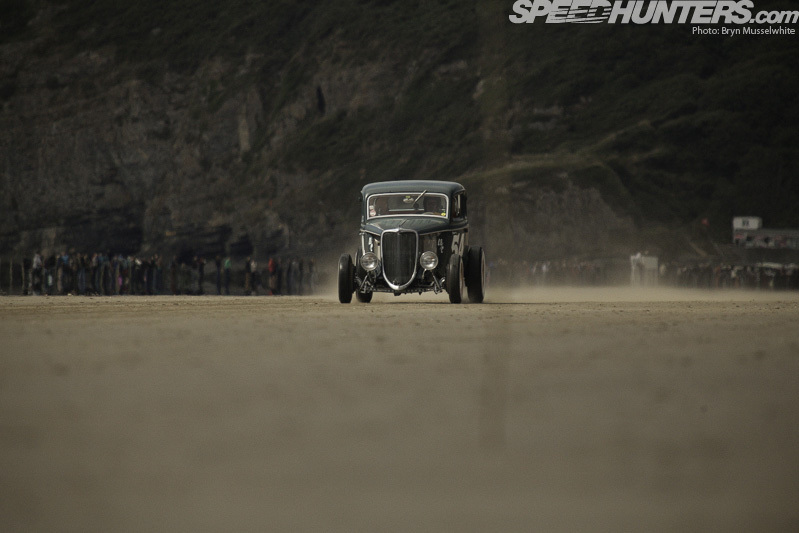 And it wasn’t like Neil was going to miss out either, quickly lining up in his 3in subtly chopped Model A. In fact, everything that could make a run, did. 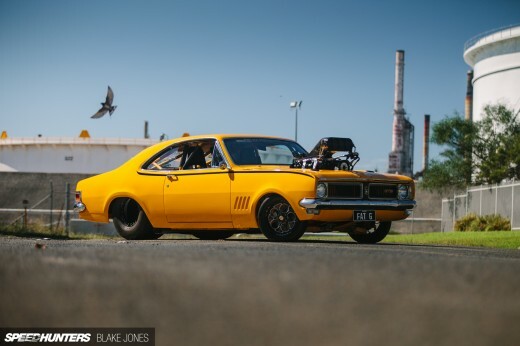 The surfboard was probably worth 10 per cent across the rev range. 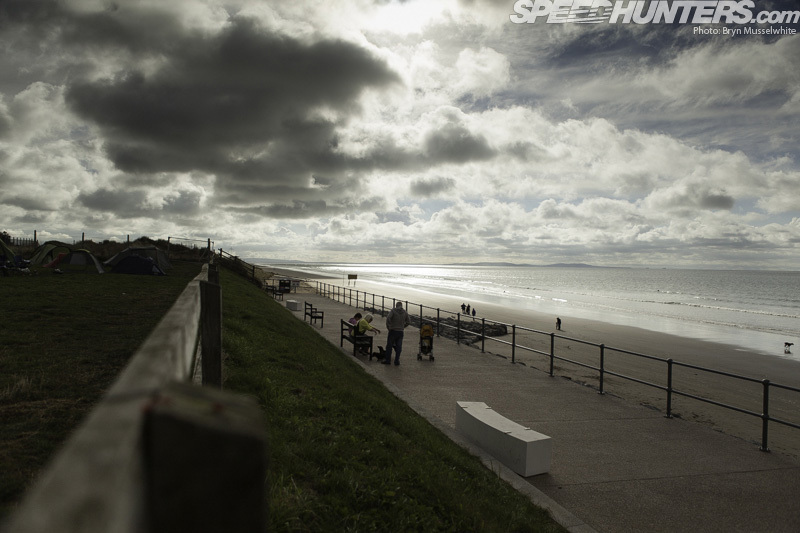 With the sea rapidly returning, it was a timely reminder that there was no time to get too comfortable. Its unstoppable march was going to stop play, but that also compacted the excitement for me. 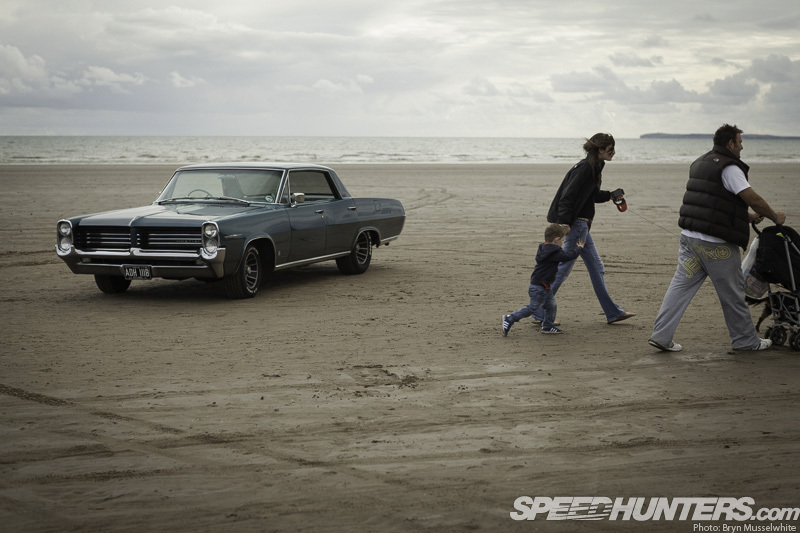 This isn’t like Bonneville where you have days. We had hours. Sure, we could come back tomorrow, but the finality of seeing the course wash away was just too much. I’ve no doubt that this event will happen again though – it just has to. 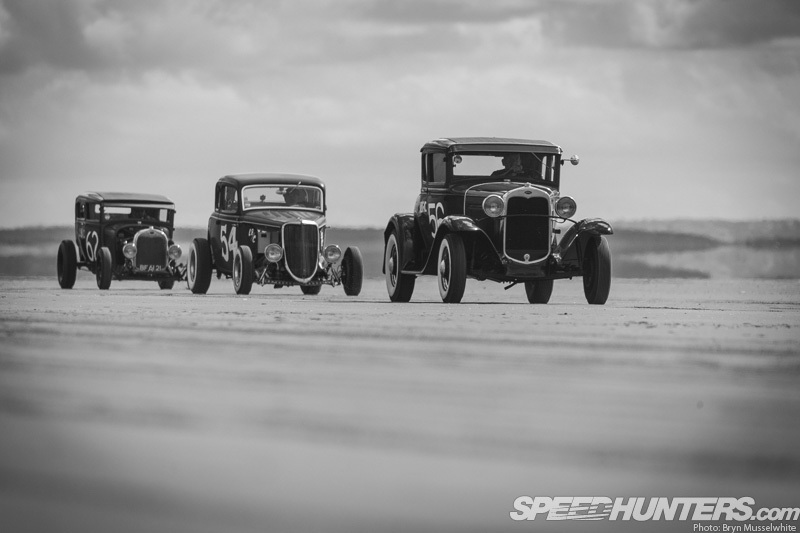 But right now there’s a full line up of hot rods with a combined age approaching 8000 years sat at the end of the timed zone and waiting to return en masse one last time. 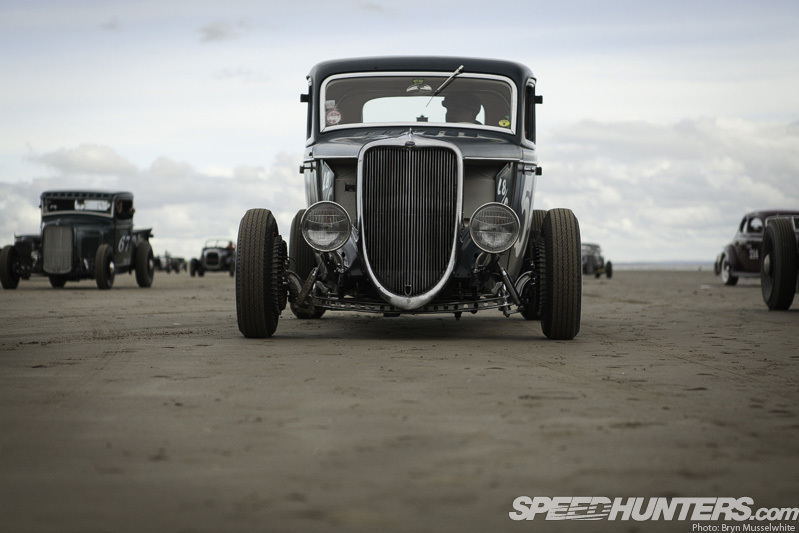 The hot rods are coming! This short film shows it better than my picture; it was a very cool couple of minutes. As they come in to land there are smiles and hand shakes everywhere, and a definite sense of release and relief in the air. It’s been done. Nothing went wrong and now it’s time to relax. Some people may have decided to do some circle work and celebrate. But others preferred to take the opportunity for a photo or two with the dramatic backdrop of what looks like a heavy storm. … people returned to the higher ground. I was left standing alone, wanting more. Chances were taken here today, and rewards have been reaped because of that gamble. Given the American orientation to this event, it makes me smile that Amy Johnson took off from this very same beach to make her non-stop flight to America in 1933. So does this also signal the start of something big? Whatever the future holds, good things happened here today – very good things. 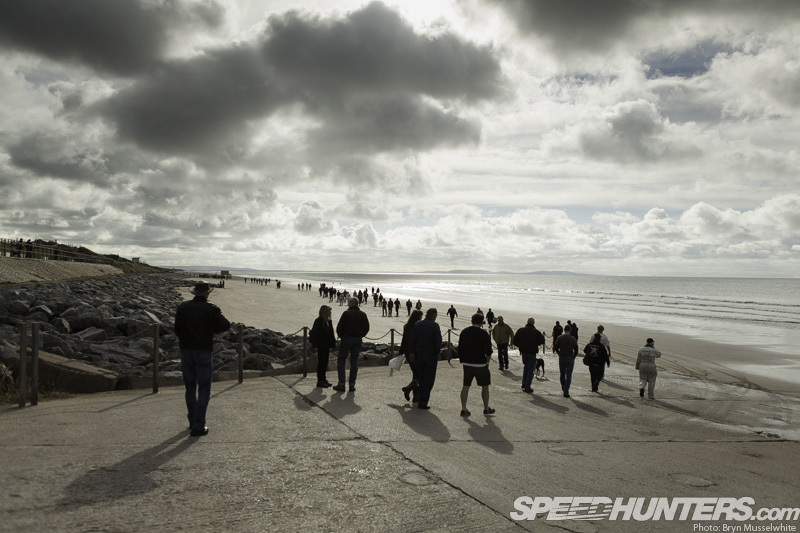 The only trace of them will be in the memories – no amount of tyre tracks in the sand or flags planted triumphantly will mark this landscape. In fact it’s quite the opposite – it marks you. 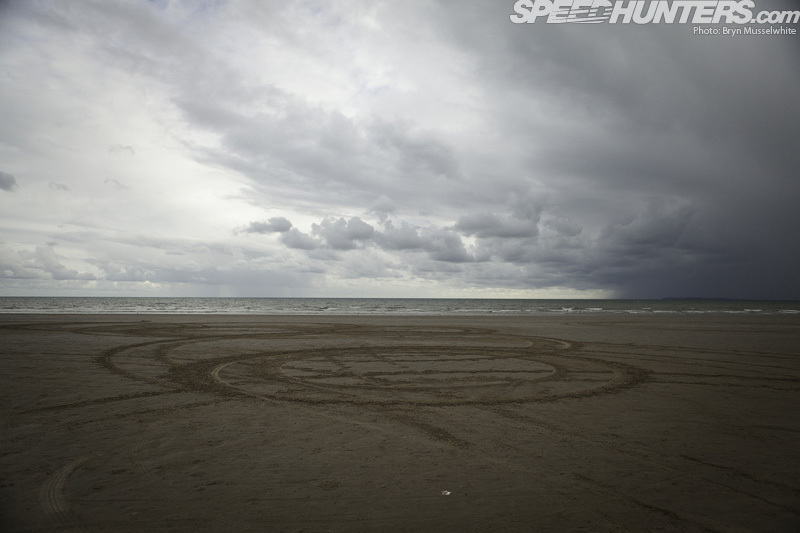 The sand might physically get everywhere, but it will also get under your skin too. 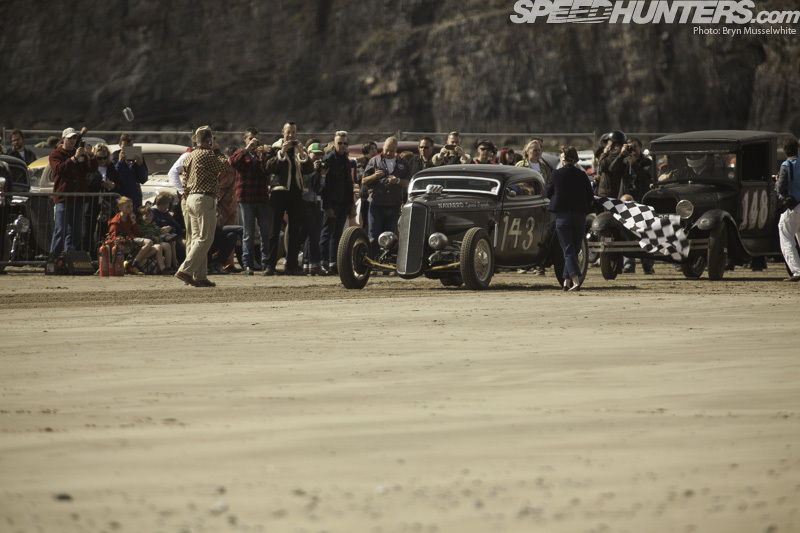 Pendine has witnessed some incredible things over the years, and although today may not have seen any records broken, it will rest for a long time in the minds of all the people here. But then again maybe I’m reading too much in to it – thinking about it too much. Let’s just keep it simple eh? 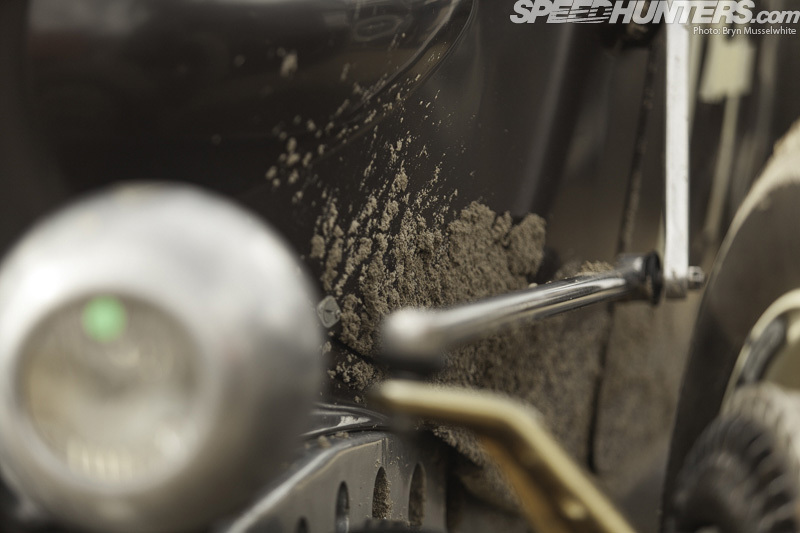 Maybe it’s all about going fast… really fast. 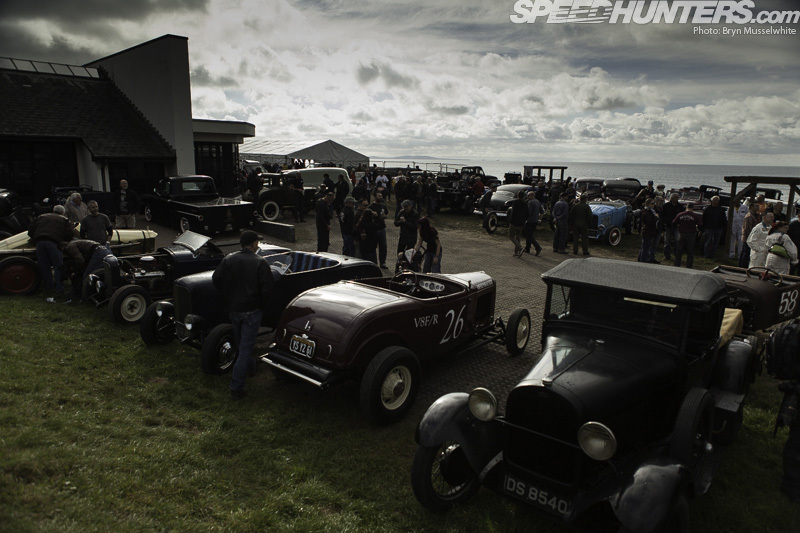 A massive thank you to everybody at the Vintage Hot Rod Association for putting together such a good day. I’ll have more in Part two where I look at the people and details that made this event so good. What a great event and thank you for the excellent photos and dialogue. 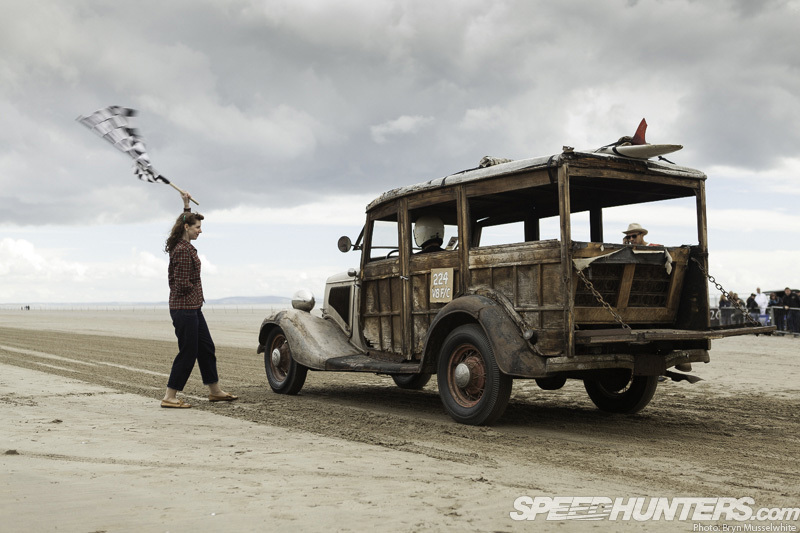 This reminds me of the times when we could drive our cars on the sand of Long Beach, Vancouver Island, at least until bureaucracy raised its ugly head and decided to protect us from ourselves. It is very refreshing to see the lack of government intervention that permitted the running of this event. Great work by all involved. This is a great inspiration and its perfect to have our own Utah here i the UK!! 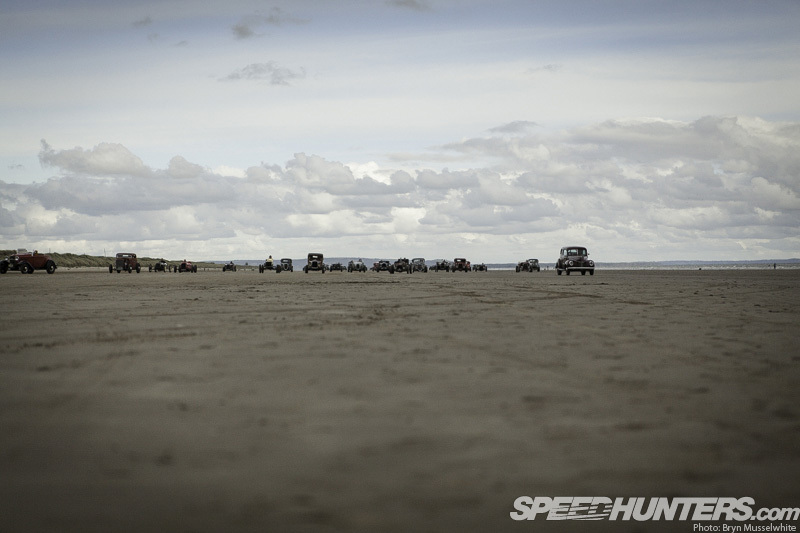 The event is now two years old and even though the 2nd event topped the first in many ways I don't think any words written anywhere else captured the feeling of the first time we rolled on to to the sand as much as this article did. Superb. In the mortal words of Gray Baskerville..."That is soon bitchin". 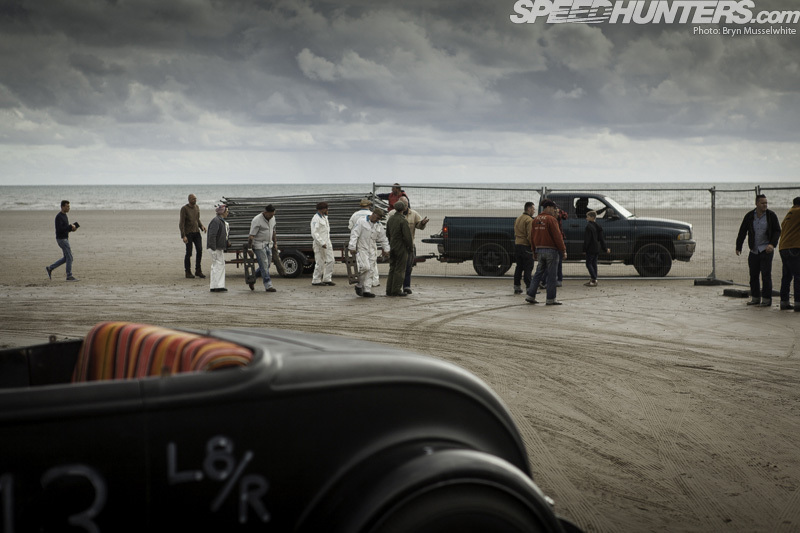 Robert Winkelmann Speedhunters_Bryn RodChong John Joe Vollans How about posting a picture of "Babs"? You guys are INSANE! 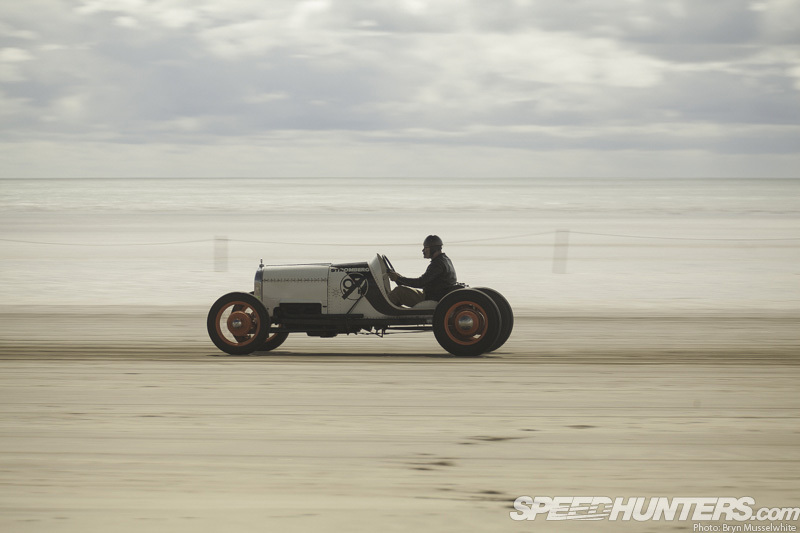 Skinny bias-ply tires, on ancient wire wheels, on ancient suspensions, in open cockpits, with a pudding-bowl helmet -- or none -- on SAND! 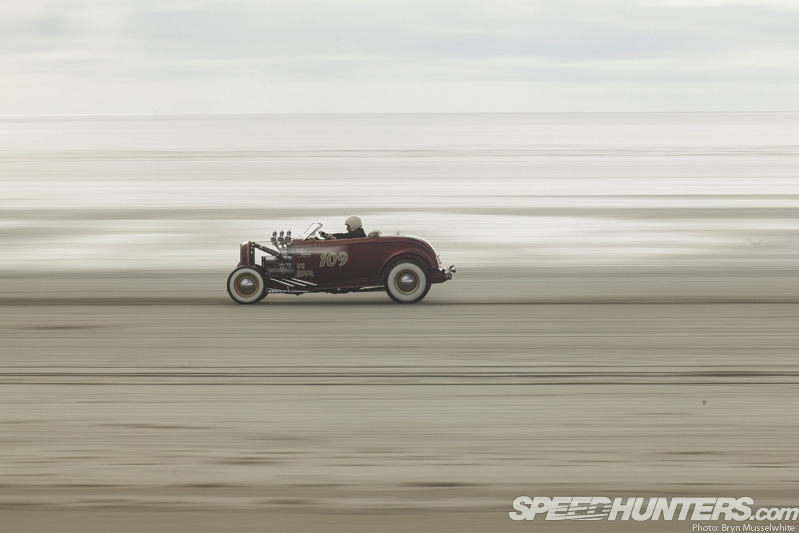 There must have been a God of Hot-Rodding watching over. Still, you have got to love the Welsh. Amgueddfa Cyflymder Pentywyn, indeed. Every word the Welsh have looks like a bad Scrabble pick.